(Newser) – President Donald Trump told an appreciative audience of conservatives Saturday that he will win re-election in 2020 and by a bigger margin than his 2016 victory, the AP reports. He mocked Democrats for their framework to combat climate change and said House lawmakers pushing to expand their investigations of him are "sick." In a wide-ranging speech at the Conservative Political Action Conference, Trump rehashed his outsider campaign that overcame long odds and a crowded field of established politicians to claim the White House over Democrat Hillary Clinton. When he made his prediction of a second term, the crowd responded with chants of "USA, USA, USA." Trump praised the conservative movement, saying "Our movement and our future in our country is unlimited." As he looked back to 2016, the president described himself as "probably more of a conservative than a Republican," but says people just didn't understand that. Trump also called the Mueller probe "this phony thing" and took aim at the Democrats' Green New Deal, a policy proposal floated by some liberal Democrats in Congress and backed to varying degrees by several of the party's 2020 presidential candidates. "I think the New Green Deal or whatever the hell they call it—the Green New Deal—I encourage it," he said before mocking the notion of a world with "no planes, no energy." The Democratic plan calls for a drastic drop in greenhouse-gas emissions from fossil fuels such as oil, coal and natural gas, but in no way grounds airplanes or pivots the country to renewable energy only. 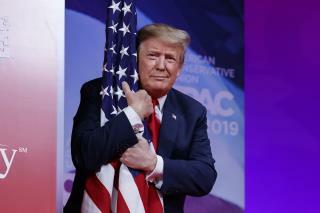 The flag the guy embracing not anyway representative of Americans nor American values(Indian Americans who owns this country). It is half British, the British who kicked out their own people as petty thieves, criminals, robbers, unwanted, undesirables, and as garbage. First these people were kept in boats in Themes as prisons were overflowing. Then banished them to faraway land not see them again, right! Then other half of the flag not known where it coming from and, no one got a clue about it. So, the stars in the sky - and those star drawings are what human eye can see are and not real stars as it is. Hence, this imaginary flag got no significant value as such with stranded bunch people coming from Europe with medieval middle eastern desert Ethiopian slaves founded belief system. It is, of course, very unfortunate situation as they are not either refugees nor citizenry applicability.